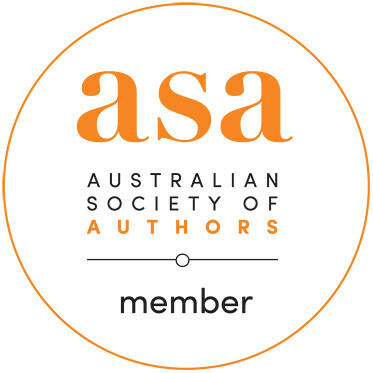 Karen Tyrrell is an award winning Brisbane based, ‘resilience ‘author, who publishes on this theme for both children and adults. Her earlier books, like Stop the Bully, have dealt with themes like bullying and mental health. Harry Helps Grandpa Remember marks a slight change in direction, in tackling the realities of dementia and their impact on family, although it still has at its heart the theme of empowerment and emotional resilience. Harry is about the special love between a little boy and his grandpa who has Alzheimer’s. Harry will do ANYTHING to help his grandpa remember . . .
1. 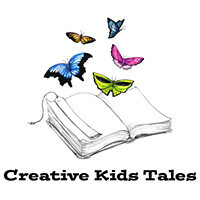 June: Why do you think picture books on this topic are important? Karen: One in six people are affected by dementia, Alzheimer’s and memory loss. These stats are on the sharp incline. Children are affected by their grandparents and loved-ones affliction and need to understand the disease and how their grandparents still love them. Picture books are the perfect way to teach children coping skills for memory loss. 2. 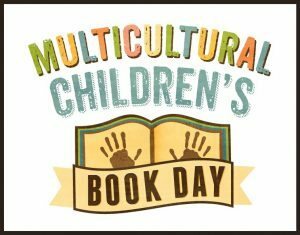 June: What does your book offer that isn’t in other books already out there? Karen: Harry Helps Grandpa Remember is written from the children’s point of view, as a problem solving, problem verses solution challenge. Harry gently shows the realities of dementia at the same time encourages children to take an active role in their grandparent’s lives. Harry Helps Grandpa Remember teaches memory boosting skills and coping skills for the child and for the one affected. 3. June: I’ve heard about your pantomime of the book. Why did you launch it with a bit of play acting? Dementia is a difficult subject to present to children. 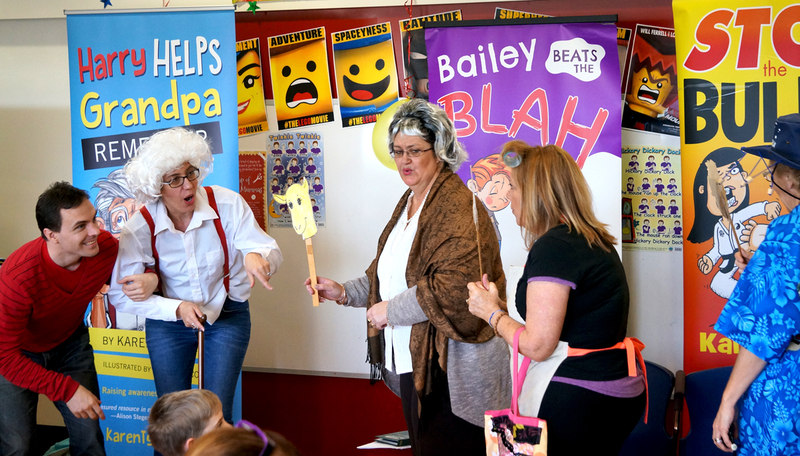 An interactive, multi-media pantomime displaying humour, strong emotions and a sense of fun communicates the deep messages of dementia awareness, coping skills and most of all, love. The pantomime and the actual story Harry Helps Grandpa Remember spring-boards in-depth discussion. Scene from the Pantomime at one of the local launches. 4. June: Who was involved? Karen: Actually our writer’s group, Write Links played most of the key parts. The lead role of Harry was played by Anthony Puttee, who played Bailey in Bailey Beats the Blah, a book about lifting a child’s mood. 5. 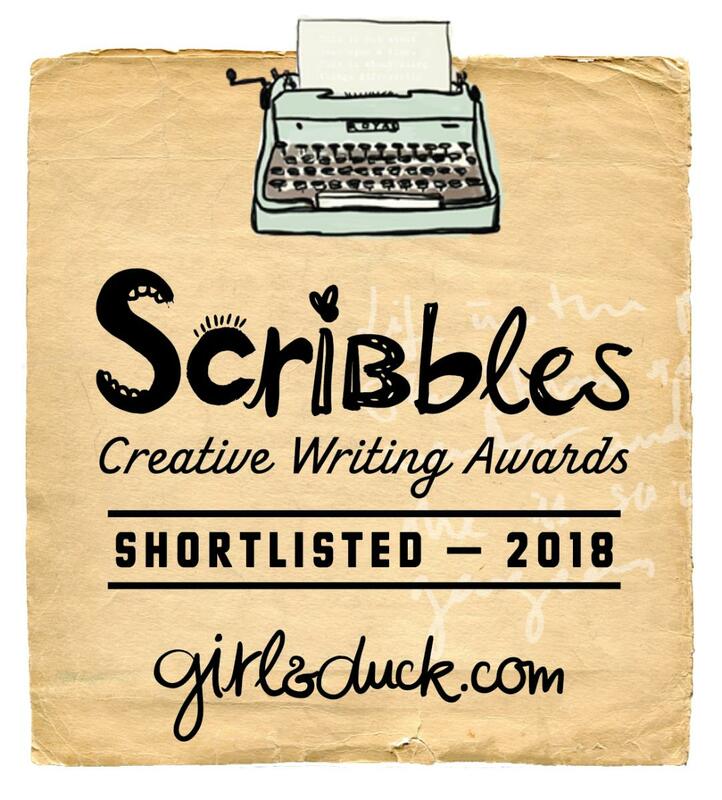 June: As a hybrid publisher (seeking traditional publishing options but also self publishing) myself I am interested in how you found your designer and editor. 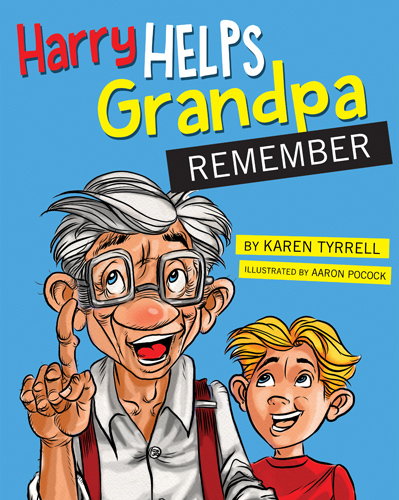 Karen: My designer, Anthony Puttee designed the cover for Harry Helps Grandpa Remember and formatted the pages too. My editor, Penny Springthorpe is an ex-Penguin editor. I worked collaboratively with her, developing the characters and the story line to the highest possible standard. Both Penny and Anthony work for Book Cover Café, who act as my publishing advisers for my imprint Digital Future Press. I’ve worked with Book Cover Café since my very first resilience book, Me and Her: A Memoir of Madness. 6. June: What did you most like about working with them? Karen: I loved working with all the staff of Book Cover Café in a collaborative way, bouncing ideas off each other. I independently sub-contacted illustrator Aaron Pocock to create full colour illustrations. Penny, Anthony and Aaron are all incredibly talented and creative. They’re all perfectionists too, demanding their own work is completed to the highest publishing standard. Harry Helps Grandpa Remember is now on Amazon world-wide as a print Book and as an eBook. You can also find it in many local Brisbane book stores. Please leave a comment on any of the visiting sites or a chance to win a signed print copy or 5 eCopies of Harry Helps Grandpa Remember. 6 Copies to be won. 6 Winners announced 3 July. You can still also retrace the tour and make comments on earlier visiting sites. Previous Post Why Kickstarter for Magic Fish Dreaming? Thanks so much for your insightful questions on Harry Helps Grandpa Remember. Hope your readers enjoy learning about how Harry was created. 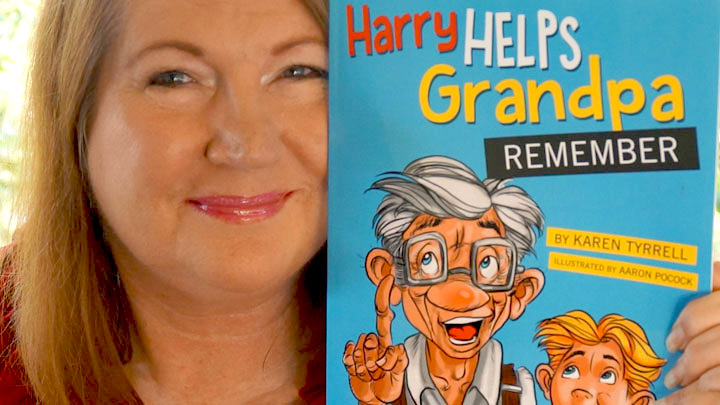 Karen tackles the difficult issues, with skill and compassion, that we as parents have difficulty talking about, especially her latest book Harry Helps Grandpa remember which is very close to my heart. 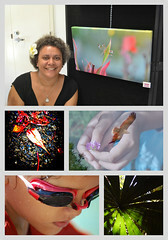 Blogging was my lifeline when living in the Cassowary Coast. Just a cool way for writers to stay in touch with the world and keep themselves writing. Lovely to hear from you Alex.